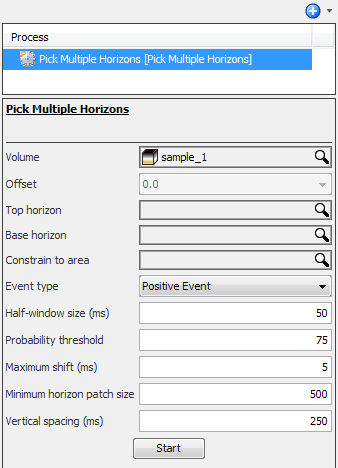 Description Automatically pick multiple horizons from seismic volumes. This process picks multiple horizons simultaneously using the waveform propagator. Parameters provide additional control over horizon spacing and minimum size. Tip: In cases where many horizons are displayed, the 3D view can get cluttered and difficult to interpret. Switch horizons between showing intersections and surfaces in the 3D view by opening the Horizon tab and clicking Show whole or intersecting horizon in 3D in the panel header. 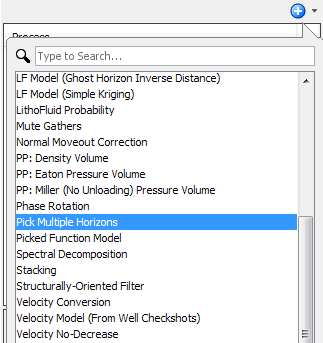 In the Details Panel at Volume, select the volume on which the multiple horizons will be picked. Select the common offset value where you want to pick your horizons at Offset. This field will only be enabled if you have selected a gather volume at Volume. At Top horizon and Base horizon, you can select a top and bottom horizon that you have created to constrain the multiple horizons picking between the upper and lower horizons. At Constrain to area, select a polygon/probe to constrain the picking within the area covered by the polygon/probe. To do this, you should first create a polygon in the Map View or a probe (see Creating a Polygon in Map View and Creating a Probe). Half-window size — The amount of time/depth searched along each trace by the waveform propagator to determine correlation. Probability threshold — Value (%) is a goodness of fit measure that determines whether a point should be considered to fall on the horizon being defined. Maximum shift — The maximum vertical distance that the horizon propagator can "jump" from one point to the next. Minimum horizon patch size — The minimum number of points in any horizon patch to be included in the results. Vertical spacing — Vertical spacing between the horizons. Click Start to begin picking. 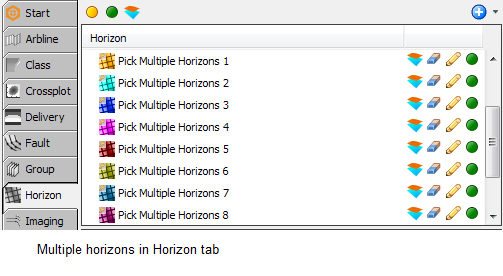 Once the process completes, you will see multiple horizons created in the Horizon tab in the Control Panel.